Shortly after 07:30 this morning as I was nearing Taunton, I caught the news on BBC Radio Somerset, which announced our donor registration event at North Street Church. The newsreader made the point of saying that there were 610 people in Somerset on the stem cell register. Superb. This heralds one of the learnings that Marina (crouchend4margot.org) initially flagged, namely: make it relevant by pointing out what participation on the stem cell register exists in the locality. I wasn’t in range to hear today’s organiser Becki Robertshaw, who was interviewed earlier that hour for several minutes by the same radio station, but I was thrilled to later hear how much airtime she was afforded, how she seized the nettle & also the research which had clearly been undertaken by the interviewer – click here to hear a recording of Becki’s radio interview. In the lead up to today’s event, Becki has been omnipresent on social media, which is remarkable given that she describes herself as “not very good at social media”. 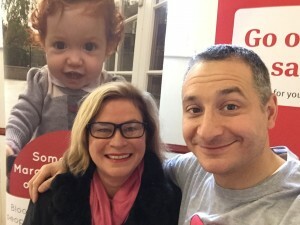 It’s a testament to the extremely competent and effective team that she pulled together in advance of today, which includes, amongst others, a web guru and social media fiend. 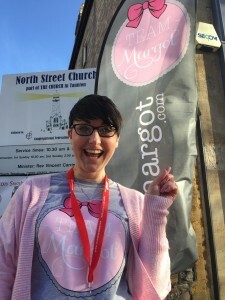 It’s easy to draw like comparisons with those who have organised other Team Margot events in a similar way: both Margot’s aunties, Charlotte (Wolverhampton) & Nadia (East Sheen), Marina (Crouch End) and Catherine (Notting hill). These are all passionately motivated, formidable team builders & organisers. There’s a lot to be said about the sheer tenacity of all these individuals, which is something Becki exudes in spades. Becki’s team was essentially her family (and I am not just referring to her husband Matt & son Brandon, but literally ALL of them) and friends – all of whom were very aware of Margot’s story – each person playing a specific role ranging from very involved digital / social media responsibilities (before, during and after the event) to more simple tasks like meeting & greeting at the door, making cups of tea, requesting people’s email addresses before leaving and passing around the cake. Everyone mucked in and provided cover where needed. No one bleated. It was all smiles. Everything ticked like clockwork. 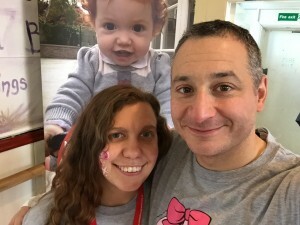 Unlike similar events I have attended before, the other thing that struck me today was that, aside from her family and friends, Becki knew very few of the other thirty-something volunteers. 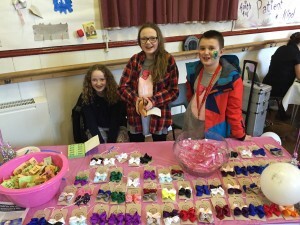 The vast majority of the volunteers were people who had heard / read about this event and contacted Becki, seeking to muck in & make a difference. There was a lot of love in the room. And we all felt it. Today’s venue was probably the best I have seen; it provided an excellent functional facility for a donor registration event with what was effectively one very large room which was slightly “pinched” in the middle. 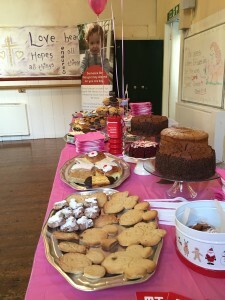 It had the effect of creating two separate yet visually connected spaces that provided a clear separation between the registration hall and the other activities: cake / bow sales, face painting etc. Becki made a real effort to ‘dress the room’ with simple yet sensitive touches, which Vicki noticed & appreciated from the pictures on Facebook. The same door provided the only entrance and exit, which really helped keep track of the comings and goings (at times during the day, there were a lot of people present simultaneously). We were blessed by the weather – whilst cold, it remained dry and bright, which meant that there were lots of people out and about today. And for me, that was the best thing about the venue which was located right in the middle of a high footfall shopping street. Having volunteers stand outside on the high street (alongside the buskers who were invited to attend) with leaflets proved to be extremely productive; I estimate that perhaps a third of all those that registered today were encouraged to come in off the street, without any prior knowledge of the event. This underscores the importance of ensuring that everyone who registers is aware of what might be involved if they are selected to actually donate their stem cells or bone marrow. We take the view that if people are in any way unsure, then it’s better for them not to register in preference to them registering and then ‘changing their mind’ when their stem cells are desperately required. 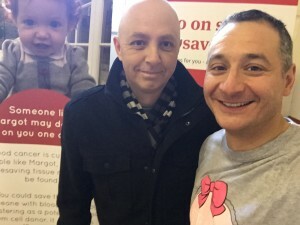 I found myself recommending that one chap specifically did not register today (he was unsure about the method of donation) and suggesting he instead go away and consider further; if he later became more comfortable with the idea, then he could register online and have a DIY swab kit sent to him at home. 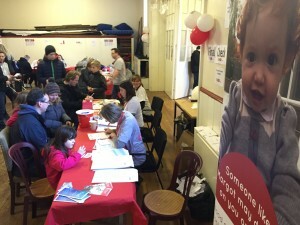 Today was another really good day in terms of registrations and it exceeded the number that Delete Blood Cancer UK would ordinarily expect from a donor registration event of this nature. 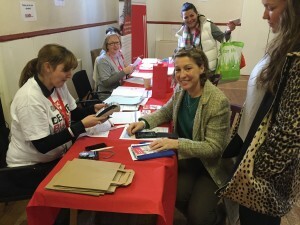 We registered and swabbed a total of 275 people, which represents a whopping 45% increase in the number of people on the stem cell register in Somerset. 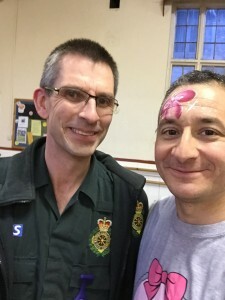 with Steve, a paramedic who got held up with a job so arrived 45 minutes after we had started packing up – just in time to register. Fabulous. 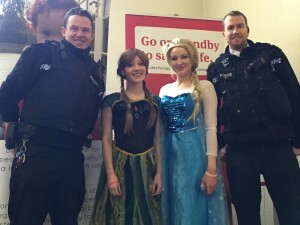 THANK YOU and really well done to everyone involved today & in particular Becki, who absolutely smashed it. p.s. 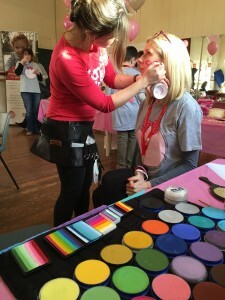 we ran today’s event in partnership with Delete Blood Cancer UK and raised over £2,000 for them. Really was a privilege, when you have kids it makes you evaluate everything in your life. We lost my uncle to skin cancer and one of my childhood friends has recently been diagnosed with the same thing. Unfortunately, I have lost quite a few friends, which is my main reason for getting involved and joining up. 3 months ago I joined up to become a blood donor, I see this as the next step. I have a little one of a similar age and my boy has red hair & brown eyes. I couldn’t not – she captured my heart and attention straight away. If theres anything the girls and I can do pls get in touch. I have have friends in plymouth and cornwall as I’m originally from Looe, so I’m trying to spread the word! 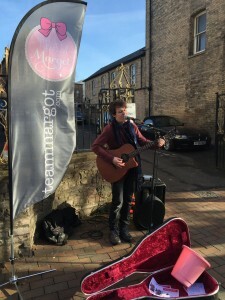 Hi – I volunteered today at the team Margot event in Taunton. I just wanted to say thank you for a truly heartwarming and inspirational day. I cannot even begin to imagine what you have been through. Having a two year old myself, it really hits home for me, and to see your remarkable family draw such strength from such tragedy is incredibly humbling. Just wanted to say all the best for the future and if I can help further in anyway I’m only too happy to do so. See what your beautiful daughter and you and your amazing family have started and it just keeps getting bigger and bigger! 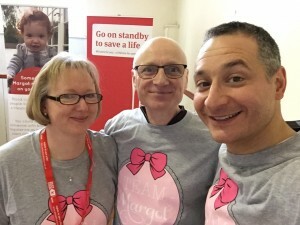 So proud to have been part of @taunton4margot. Brilliant day with amazing people.